The ground at the Summit Racing Equipment Atlanta Motorama will once again shake and tremble this April 28 and 29, as BIGFOOT® monster trucks return for the fifth straight year to the show's extreme motorsports area with daily earth-shattering car crushing exhibitions, photo opportunities, driver autograph sessions and displays. Making a return visit to the Summit Racing Equipment Atlanta Motorama in 2018 are BIGFOOT No. 5 and the eponymous Summit Racing Equipment BIGFOOT. At 28,000 pounds, and with two stacked pickup-truck frames, a pair of five-ton military axles and 10-foot-tall tundra tires, BIGFOOT No. 5 is the tallest, widest and heaviest pickup in the world. 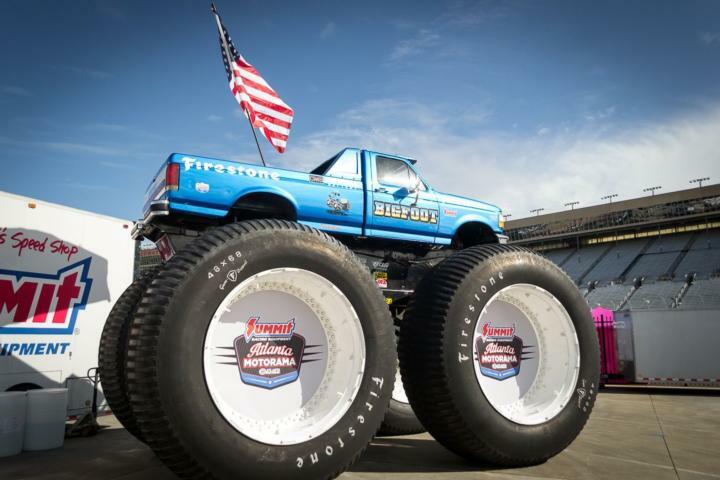 Meanwhile, the Summit Racing Equipment BIGFOOT is the newest in the 10-truck-strong active BIGFOOT fleet. Car-crushing exhibitions will take place twice each day of the festival, and show attendees can take in the spectacle at no extra charge. Saturday's crushings will take place at 11 a.m. and 2 p.m., while Sunday’s will be at 11:30 a.m. and 1:30 p.m.
Additionally, BIGFOOT drivers will be available to meet and sign autographs between car-crushing exhibitions, and the trucks will be on display for photo opportunities. BIGFOOT was born, unknowingly, to Chandler in 1974 when he purchased a vehicle capable of matching his active, outdoor lifestyle in the St. Louis area. After ordering a brand new 4x4 pickup with plenty of cargo room and off-road prowess, Chandler’s truck was constantly modified with bigger and better parts to support his off-roading hobbies and to serve as a promotional tool for his company, Midwest Four Wheel Drive. Eventually, the Chandler’s truck earned the nickname Bigfoot, and Chandler began entering the oversized vehicle in local truck and tractor pulls, off-road events and auto shows. Following its first paid public appearance at a Denver auto show in 1979, BIGFOOT’s popularity erupted across the country, and more trucks were added to the BIGFOOT fleet to keep up with its demand. Forty-one years later, BIGFOOT today is a household name, famous for its enormous trucks and thundering car-crushing shows. To date, 21 BIGFOOT trucks have been produced with varying themes and unique characteristics. Along with BIGFOOT, many other motoring exhibitions and activities will make up the 5th Annual Summit Racing Equipment Atlanta Motorama, including over 1,000 custom and show cars and vehicles from nearly every decade in the last century.